December was a very busy month for the children of the school, with Christmas spirit felt throughout as each class busily prepared for their festive performances. 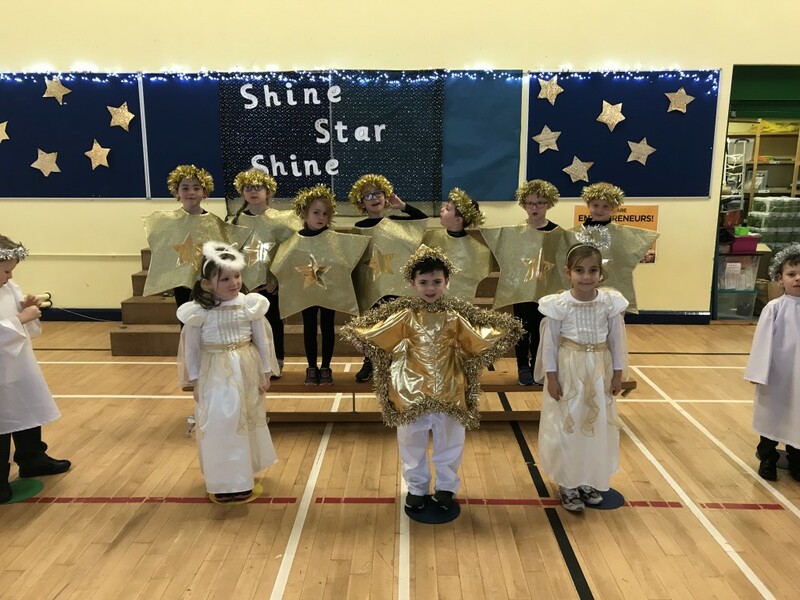 The Junior and Senior Infants along with children from the Naíonra performed the wonderful nativity play ‘Shine Star Shine’. The play was based on a big star who would not shine. However, with the help of the other stars and the love from the baby Jesus the big star finally began to shine above the stable leading the wise men and the shepherds to the baby Jesus. musical talents of 1st, 2nd, 3rd and 4th class were on full show when they gave a festive performance of song and dance. The children sang an array of Christmas songs from Silent Night to Winter Song. The children played their tin whistles and we were even treated to guitar and fiddle playing also. The highlight of the show saw 1st and 2nd dance to Rocking Around the Christmas Tree and 3rd and 4th dance to Rockin Robin. Our Senior classes sang at the Christmas Tree Lighting in Berrings. It was a very special evening enjoyed by all in attendance. It was a month of fundraising in Berrings NS. We held a cake sale to raise money for children in an orphanage in Vietnam and also had a Christmas Jumper day for Crumlin Children’s Hospital. The St.Vincent de Paul were very thankful to the children are their parents who generously contributed non perishable goods to their annual Christmas collection. Christmas themed games and activities were set up in school halla for the all the children to enjoy. Collecting presents on a scooter board was definitely a firm favourite ! There was a very special visitor to the school on the 19th of December. Santa himself donned his red suit and kindly gave a selection box to each child. He was greeted by Christmas songs and dances and excited children who couldn’t wait to tell him what was on their Christmas lists.